Executions for desertion throughout the Army of the Potomac did cause many men to return to the ranks, but many more never did. At the end of September, 1863, the Fourteenth Connecticut Volunteer Infantry carried the names of nine hundred men on its active duty roster, but only five hundred and eighty officers and enlisted men were present for duty. Major Theodore Ellis (pictured at left) received two promotions in quick succession, to lieutenant-colonel on September 22 and to colonel on October 11. Captain Samuel Moore of Company F was promoted to major on September 22 and to lieutenant-colonel on October 11. Captain Carpenter of Company C was transferred to the Invalid Corps, a result of nagging wounds received at Fredericksburg, Finally, Captain Davis of Company H was called to account for his frequent lapses in judgement, and dismissed from the army for neglect of duty at a conscript camp near New Haven. This entry was posted in 1863 - Autumn, Life in Camp, Men of the 14th, Recruitment & Training on September 27, 2013 by admin. 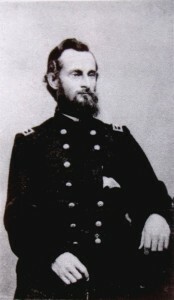 After his acquittal on the bogus court-martial charge, Captain Samuel Fiske served as an inspector-general for the army. One of the regiments he inspected in the course of his duties was his own, the Fourteenth Connecticut, which was now encamped at Elk Run. Immediately upon his arrival, Fiske was told, “Only ten gone since last roll call.” Fiske wrote: Three thousand dollars worth of New England’s purchased heroes had vanished within the two hours previous to my arrival; $18,000 worth in the three days previous. Sixty out of two hundred and ten in one regiment, and the ratio increasing constantly. One of them boasted that he had already made $1800 in the substitute business. Several others had sold themselves twice. Another who had gambled away the most of the $300 that constituted his prize, in order to get himself in funds again (temporarily till the next sale), stole $75 which one of our good boys had just had paid him, on the night he left. Three hundred passed our headquarters last night—all substitutes—at least one-third of them scoundrels who had been engaged in the New York riots, and found it convenient to retire a little while into the country, took the $300 to pay their expenses. Some of them won’t go back. Two were killed and several wounded on their way here from the station, seeking to break guard. We can, probably, by letting the enemy go unwatched, and turning our whole attention to these northern friends, be able to catch some of them as they are deserting, and by shooting save ourselves from any further trouble from those individuals. Fiske’s words would prove prophetic. Next week’s post will deal with one of the most tragic events in the history of the Fourteenth Connecticut: the execution of two men for desertion. This entry was posted in 1863, General Information, Life in Camp, Men of the 14th, Recruitment & Training on September 13, 2013 by admin. As an author of fiction, I’m always in need of colorful, true-to-life characters. One of the characters we meet briefly in An Eye for Glory is the new recruit Caesar Ferretti. I based Caesar on two real new recruits who joined the Fourteenth Connecticut during August, 1863, Antonio Capellini and Joshua Tripp. This entry was posted in 1863, General Information, Life in Camp, Men of the 14th, Recruitment & Training, The Lighter Side on August 30, 2013 by admin. Substitute conscript William E. Mott arrived at Cedar Run on August 11th, 1863. He was not extraordinary in any way. Mott was of average appearance—five-five, fair complexion, brown hair—and his service with in Company F, Fourteenth Connecticut would be unexceptional. Nonetheless, his story is a most compelling one, and it will require at least three posts to tell. Mott described how he became a soldier to the U. S. Pension Office in a series of letters written nearly fifty years after his enlistment. “Dear Sir In regard about my certificate of my Berth, it will be Doubtfull if I can find eny statment ove my Bearth when I was Bornd ore where I was Bornd at but I think I herd my Mother say that I was in N.Y. city have sent on to see if it was on the Regster The first I remembr living was Wickford R.I. soon after we moved to Fairhaven Mass Mother died there when I was 8 years old and soon after Father died, the six children scattered two Brothers and one Sister I have not seen sence then tryed find them when I come out of the army but could not so you can see how I am fix and I think you will find houndreds of Soulders will be in the same fix. “As I wer in R.I. State Reform School at Proverdence city R.I. James M. Talcot Superendent of the School at that time 1863 had A friend N. H. Luomes (Rev. Nathaniel H. Lewis) was Drafted A Hartford conn and they hird me to go as A subtuttet for him at $5.00 A month for three years, after I come out the army I was hired to work in the shoe shop at the school. ” In regard about my age from the school at Proverdence city R.I. I know I wer older than they clame I am. As I wer Perfect stranger to the Judge and court at New Port R.I. I clamed I was pass 18 years old at that time 1861 but the Judge thort I was not so old, so he must have put my age down lest so to get me in the school as I wer not known at New Port R.I. as I had jest come from New Bedford Mass, my mother dided when I was 8 years old as I had no home or eny one to look after me they sent me to the school. Note: The above is from background material included in The Diary of a Dead Man, 1862-1864, the unedited diary and letters of Private Ira Pettit, compiled by J. P. Ray. Mott was instrumental in preserving Pettit’s diary for Pettit’s parents. This entry was posted in 1863, Men of the 14th, Recruitment & Training on August 23, 2013 by admin. 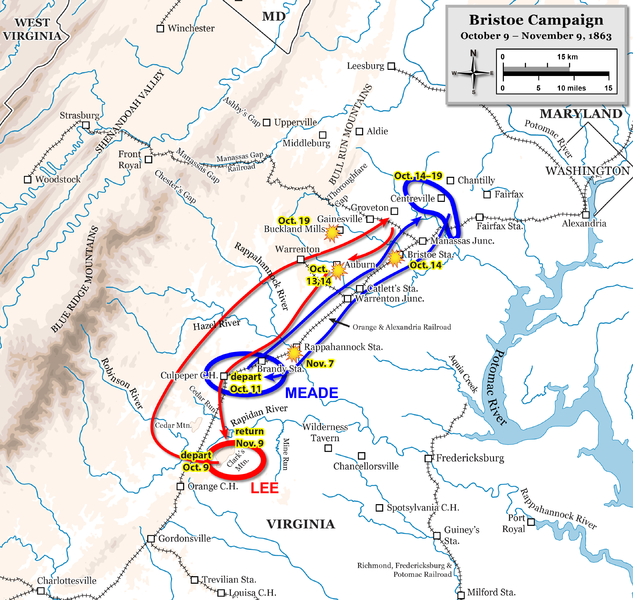 On August 1st, 1863, after marching over 400 miles and fighting the Battle of Gettysburg since leaving Falmouth on June 14th, the men of the Fourteenth Connecticut, found themselves at Bristow, Virginia, on the Orange and Alexandria Railroad. This weakened regiment was now less than a hundred strong. They were detached from the Second Corps, along with their comrades of the Twelfth New Jersey, for a period of rest and rebuilding. From Bristow they marched a few miles southeast to Cedar Run. Although I haven’t been able to pinpoint the exact location of this encampment, I believe it was near the village of Brentsville between Bristow Road (Route 619) and Aden Road (Route 646). Even today there are many open fields for drilling troops, plenty of water for drinking, washing, and cooking, and woodlands for firewood and shade from the summer sun. While some of the new men went on to become first-rate soldiers, most were what Page called “not only conscripts, but nondescripts.” They represented fifteen to twenty different nationalities, many different walks of life, and of course possessed varying degrees of basic virtues. The “old soldiers” viewed each new recruit with suspicion, and sometimes with open contempt, until the new man proved himself trustworthy. As I remarked in my post “Filling the Ranks,” desertion on the way to the front could be a profitable enterprise for the repeat bounty-jumper. The army would react to counter these mass desertions with armed escorts from the home state to the front. There would also be an increase in executions for desertion, and as we will see, there would be tragic consequences for the men of the Fourteenth Connecticut. This entry was posted in 1863, General Information, Life in Camp, Recruitment & Training on August 16, 2013 by admin. Little of substance has been written about Lt. Col. Sanford Perkins. Sgt. Hirst blamed every misfortune and discomfort on his commanding officers, and he particularly didn”t like Perkins. Soldiers were always concerned with the smallest creature comforts, and it was common for a soldier to trim off the end of his belt so it fit just right. Immediately after the battle of Antietam, Lt. Col. Perkins ordered every man who had shortened his belt should to pay the price of a new belt. 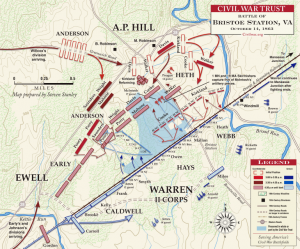 Lt. Col. Perkins was certainly a strict disciplinarian, and discipline was something the Fourteenth Connecticut would need if the men were to fight well and survive. That Perkins was also a man of courage there can be no doubt. He would lead from the front, and he would pay a heavy price in the regiment’s next battle. 5:30 – A five minute drum roll awakened the men. Any not standing properly attired for roll call when the drum roll ended would be placed on report for discipline. 5:45-7:30 – Breakfast. The men had to fetch their own firewood and water to cook their meals. 7:30 – Sick call. It was typical for the surgeon to perform a cursory examination of each man, and then return him to duty. Only the seriously ill would be sent to the hospital, and by then it was often too late. 8:00 – Mounting of the guard. Thirty men would be selected from the ten companies of the regiment, and while the band played martial music, the guard detail would march outside the works to man the picket line for the next twenty-four hours. 8:30-11:00 – Company or battalion drill. This was their basic training and it would have included marching and formation drills as well as the much needed manual of arms drill. 11:00-3:00 – Down time for the men during which they would fix dinner, write letters, and see to maintaining and perhaps improving their daily existence. 3:00-5:30 – More drill ending in dress parade, when the men were dismissed for the evening. After supper the men would gather in small groups to talk, play cards, or sing camp songs. It was also common for the regimental band to play evening concerts. This entry was posted in 1862, Life in Camp, Men of the 14th, Recruitment & Training on October 5, 2012 by admin.